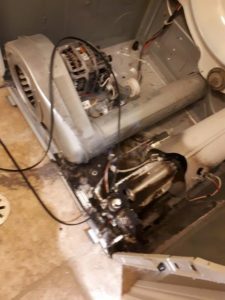 Dryer fires happen more than most people think in Ontario, we are not sure why there is very little awareness as to how important it is to carry out dryer duct cleaning, but it is what it is! One thing can be said for not recognising lint build up in the dryer is that ones dryer and duct work looks the same now as it did when it was first installed. This is a recent customers home in Hamilton, On that we cleaned the dryer duct out 3 years ago and hooked up the dryer with a better hose than the one they were using. The home owner noticed a burning smell coming from her dryer and pulled the plug from the wall. She then booked a dryer duct cleaning with us and this is our findings. The dryer only has about a 16 foot run of dryer duct counting elbows as 5 ft but the problem is with the design of the metal vent cap on the outside. The design of this metal dryer vent cap is all good in theory as it is made from heavy duty metal and has a damper to stop pests and drafts. But it is restricted towards the end, and rather than lint flowing out it relys on deflecting out. The problem is with the damp air coming out too and the lint sticks to the damper and the inside of the dryer duct cap! Over time this lint gets crusty hards and more lint gathers, this starts to jam the damper slightly open but unable to open fully it is restricted. When the moist air and lint from your dryer cannot get out because the vent cap is restricted or blocked lint backs up through the dryer duct and lint can force its way out through the ducts that are not air tight and lint settles around the dryer and gets drawn into the dryer cabinet settling in and around the dryers heating element or gas burner. As well as dryer duct cleaning (every 2 years in this case) it is important that where possible every so often the home owner looks are the vent cap outside and cleans any lint off. This ensures there is less restriction and that lint can escape to the outside. Also having the right transition hose connecting the dryer to the outside is very important. The purpose of the transition hose is should a dryer fire happen it can contain the fire inside the hose and preventing the dryer fire spreading. As lint burns fast and furiously it will hopefully not leave the dryer. For peace of mind call us today to book your dryer duct cleaning appointment. We also offer to clean out the dryer cabinet if wanted.